Home › Parenting › Five Minute Bathroom Cleaning Routine You Needed Yesterday! 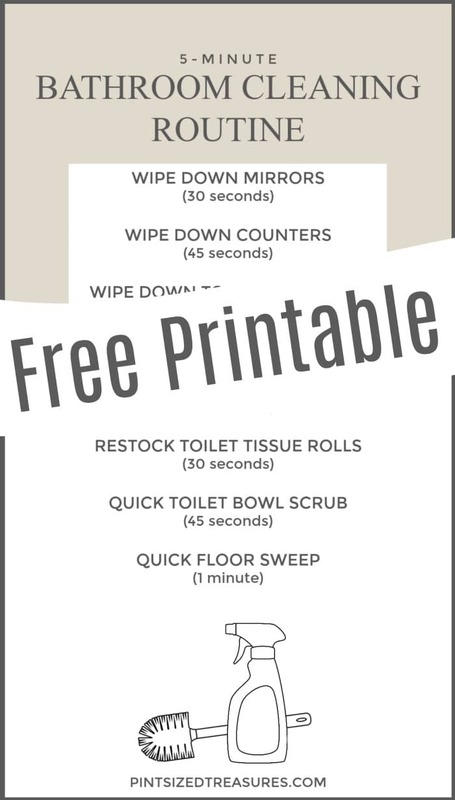 Five Minute Bathroom Cleaning Routine You Needed Yesterday! If you had to pick your least favorite chore to do around the house, what would you choose? We’ve shared some super simple cleaning tips for busy moms here, but today we’re focusing on cleaning bathrooms. 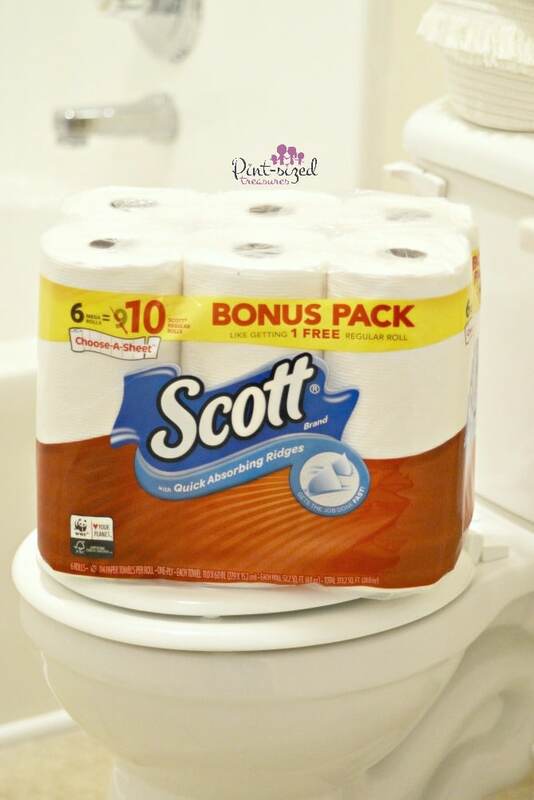 Because cleaning bathrooms can be the one chore that moms avoid until absolutely necessary. Having clean bathrooms is an essential step to having a healthy home and a healthy family. That’s a goal all of us can get behind. A house with kids can get messy fast! This super quick (FIVE MINUTES!!) 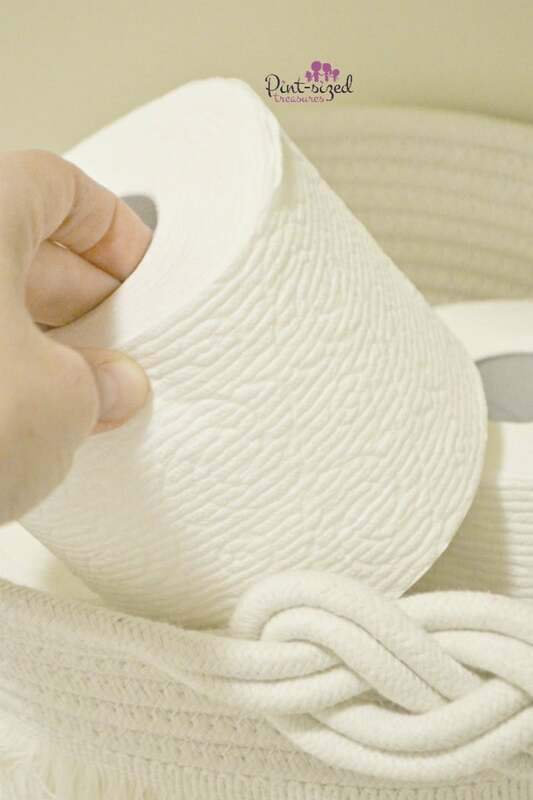 routine to help you tackle the highly detested household chore of cleaning the bathrooms. Set a timer for five minutes and follow this quick cleaning routine. Yes, you read that correctly — FIVE minutes! Even YOU have time for that! Just a few minutes of bathroom cleaning is all it takes. Can you even imagine being able to have clean bathrooms with only five minutes each day? I know you may be a bit incredulous now, but pretty soon you’ll be breathing a sigh of relief as you realize that it really is possible. As busy moms, our time is valuable. We have to be extremely intentional with our time. Sticking to a daily 5-minute bathroom cleaning routine is manageable and effective at keeping bathrooms squeaky clean without robbing too much precious time. Before beginning this daily routine, complete a deep clean of the bathroom. 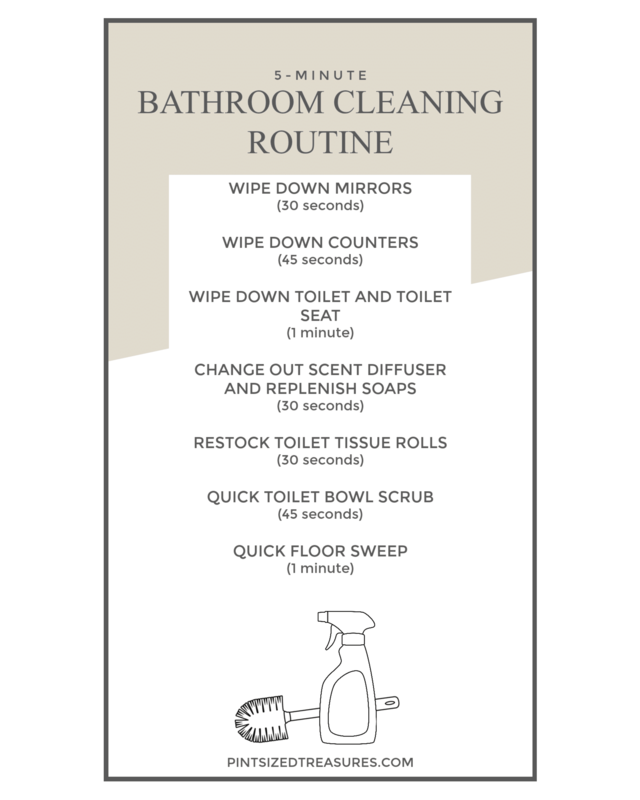 This routine helps you maintain so you’ll spend very little time cleaning the bathrooms going forward. 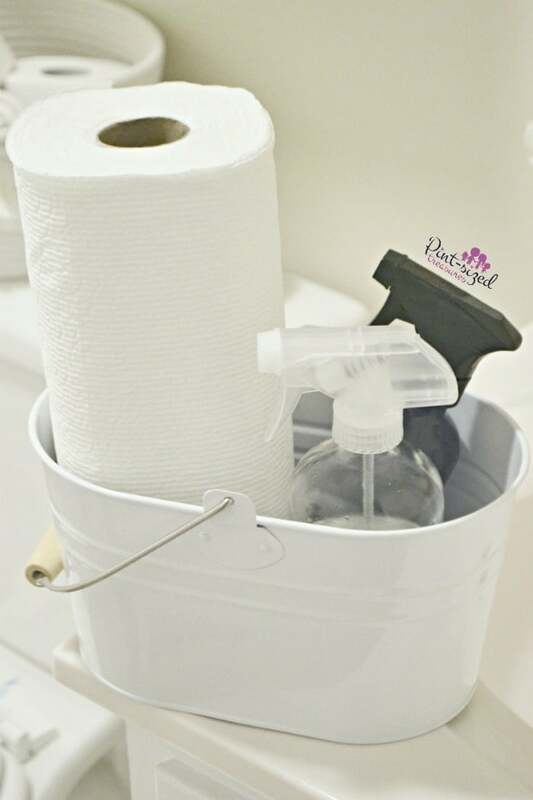 Put together a portable cleaning caddy with all your bathroom cleaning essentials like paper towels, glass cleaner, surface cleaner, and a toilet brush. Having your supplies organized and ready to go with make cleaning a breeze. 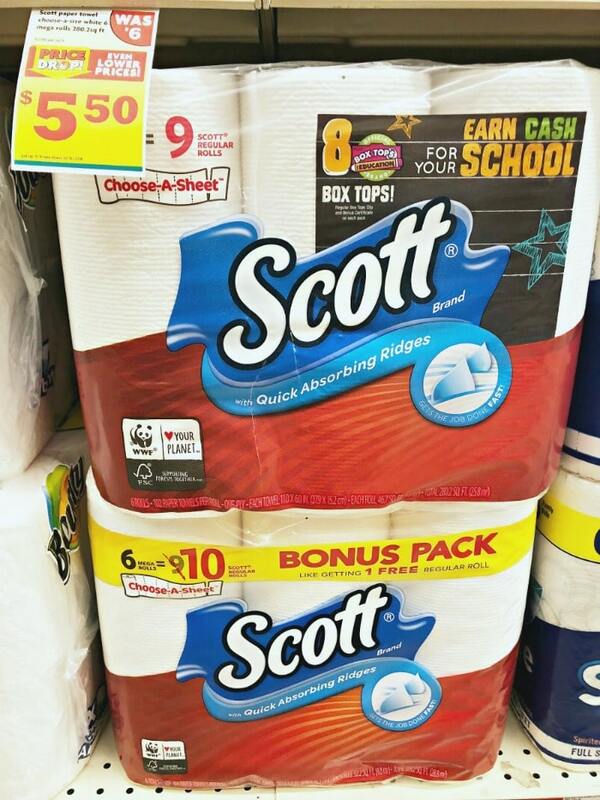 For paper towels, I like to use Scott® Brand’s absorbent paper towels from Family Dollar. Find your closest Family Dollar here! These paper towels have unique ridges that quickly and effectively soak up messes. And they’re always available at super sensible prices at Family Dollar! Get ready to spruce up your bathrooms in only a matter of minutes. 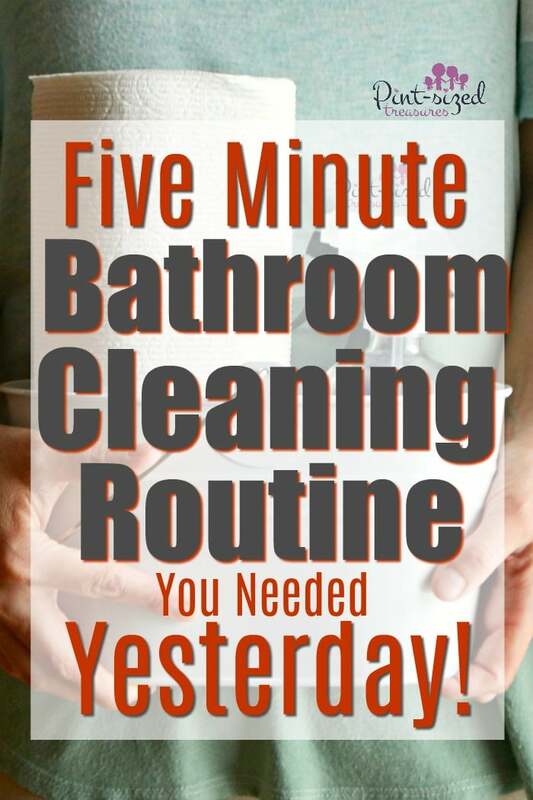 Here’s our daily 5-minute bathroom cleanup routine that busy moms can actually do! If time permits, do a quick wipedown of the showers and tub. Save a deeper scrub for the same day you choose to mop though. With this 5-minute routine, you may actually stop dreading the bathrooms now. And that time you saved can be spent where it matters most–with your family! As a way to help you even further, we’re sharing this printable with the entire routine laid out. And to help you with the final tools you need to make this routine possible, we’re also letting you know about an awesome way you can save on your bathroom essentials. 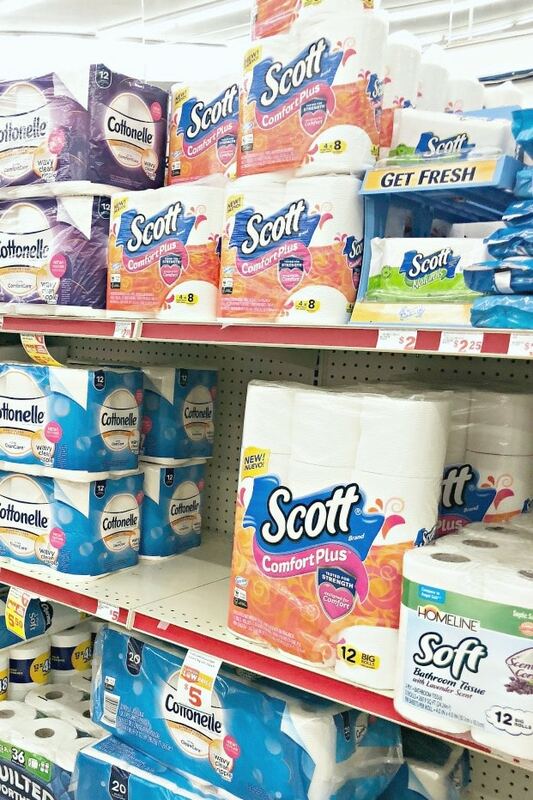 Family Dollar has the Scott® Paper Towels 6ct Mega Rolls on sale for $5.25 ($0.75 Smart Coupon) and the Scott® ComfortPlus™ 12ct Big Rolls on sale for $4.25 ($0.75 Smart Coupon). Both offers are valid from 9/2 – 10/22. Now your cleaning routine can be quick and thrifty!